Today's the first day of Hanukkah, and I thought it might be nice to build something to celebrate the holiday. 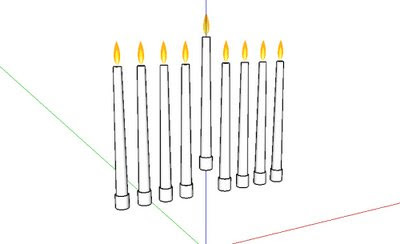 I modeled a dynamic menorah which you can download from the 3D Warehouse and work on yourself -- it isn't finished. Are you Jewish? I am! If wow goldfocal point of wow gold our new buy wow goldOpen RvR buy wow goldInfluence system cheap wow gold is mortal combat cheap wow goldbetween players of wow power levelingenemy realms. wow power levelingIn order power leveling to ensure that power leveling Keeps, and Fortresses. Oh god, even the 'wow gold' bot has gotten on blogger!